The University of Southampton has announced a new collaboration with one of China's largest telecommunications companies to develop innovative consumer audio technologies. The joint research project between the University’s world-renowned Institute of Sound and Vibration Research and Huawei, a leading global ICT solutions provider, aims to develop new technologies for terminal products, such as laptops, tablets and mobile phones. One of the main research areas will be to create higher-quality 3D sound to match the rapid developments in personalised and interactive audio technologies. 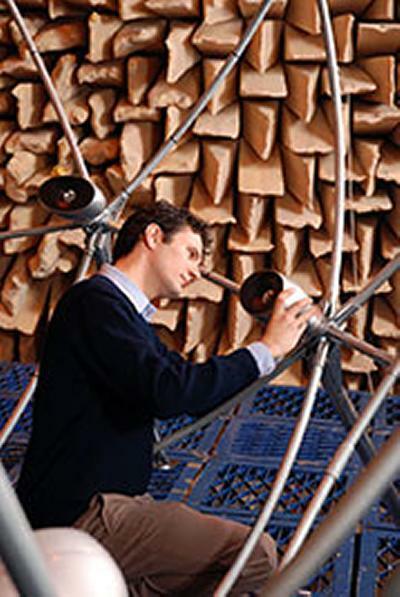 Dr Filippo Fazi, Professor Philip Nelson and colleagues from ISVR have developed a super-surround-sound system, by experimenting with a giant sphere that has 40 loudspeakers on its surface, which could produce an experience much more similar to what we hear in the real world. The three-year project, worth close to £500,000, is the first of its kind in the UK from Huawei’s Innovation Research Program, which was set up in 2010. The collaboration is part of a £10million investment by Huawei to support research programmes with world-renowned British universities. The significant level of funding has been made available through Huawei’s Innovation Research Program, which extends the company’s long-term focus on research and development into the academic world by forging partnerships with global educational institutions.